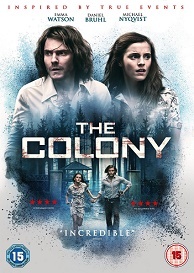 The Colony is released on Blu-ray and DVD August 22. And to celebrate we have a great competition for you and 3 copies on DVD to give away. Inspired by true events, The Colony tells the harrowing true story of Lena and Daniel, a young couple, who become entangled in a Chilean cult in 1973. When Daniel is brutally abducted by the military's secret police, Lena embarks on a desperate search for her boyfriend. She tracks him to Colonia Dignidad an infamous compound run by a sinister preacher with an iron fist, Paul Schäfer. Offering herself up as a follower, Lena decides the only way she can free Daniel is to infiltrate the cult. But can she herself survive Colonia s vicious regime?